Get AVCHD to iMovie converter at $24.00 Now. How can you import AVCHD into iMovie so that you can edit AVCHD files? Does iMovie import AVCHD video directly? Are you sure your HD Camcorders are Mac Compatible camcorders? If not, what to do? How can I import AVCHD video to iMovie 11 from local folders on my Mac? Although Apple claims supporting AVCHD video in iMovie 8, capturing AVCHD videos from some HD Camcorder models directly, if you are using the versions like iMovie HD, you still can not fulfill AVCHD iMovie import. Even in its latest version, iMovie 11, you still can not get all of the HD Camcorder recognized by iMovie. The last but not the least, even if your Camcorder can be found in the list of supported models provided by Apple official site, which indicates not all of the models are Mac compatible camcorders, 1080 60P file will not be imported either because 60P is not supported by iMovie. If you shot your AVCHD file into a 60P file, an AVCHD conversion is necessary, which means you must convert AVCHD 60P file to proper configurations so that iMovie will support it. And also, one more important situation you must think about is that: you would not always keep your camcorder available when you are running iMovie and iMovie will not import AVCHD into from the local folder if you do not copy the entire folder structure from your camcorder memory down. So how to edit the AVCHD video which you have saved in the local folder on the Mac? 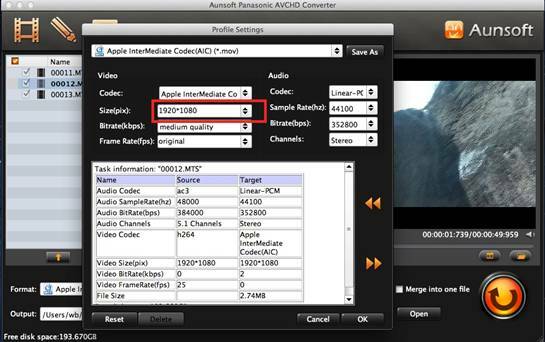 As you can see, you need an AVCHD Converter to transcode AVCHD to AIC, Apple Intermediate codec, supported by iMovie 11. Yes, you can get the video formats like MP4, MPEG and MOV in H.264 loaded into iMovie, but you will not avoid a long-time rendering in this situation. AIC is the format which are 100% compatible with iMovie 11, and it does not need rendering in importing. Which Mac AVCHD Converter is the best one to help you with such an AVCHD conversion, convert AVCHD to AIC? 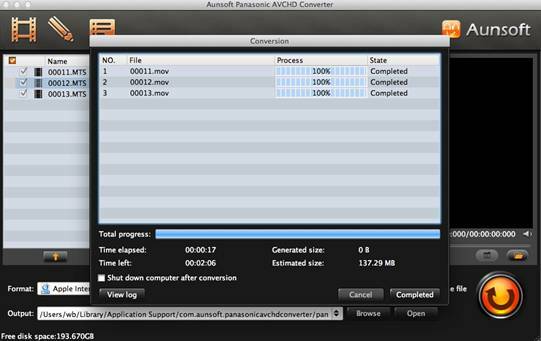 Aunsoft Panasonic AVCHD Converter will be the top Mac AVCHD Converter since it can help you convert all kinds of AVCHD file, including AVCHD Lite video files, into AIC format in sharp quality with full-utilizing all of the CPU cores on your Mac, 50% faster in conversion speed. If you are using HD camcorders like Panasonic TM-900, TM-700 series, or Sony HandyCam series, etc, this program will help you. And by this AVCHD conversion program, the AVCHD to AIC conversion will be completed within a few steps, following the directions below. 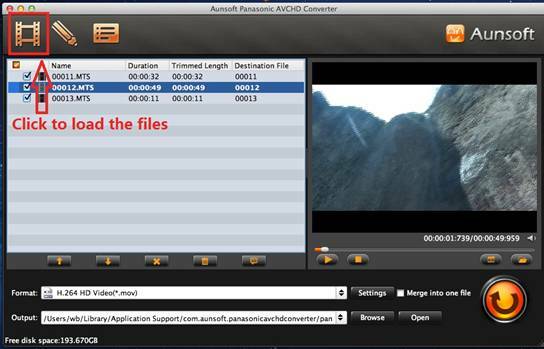 After launching Aunsoft Panasonic AVCHD Converter, please click “Add” button to load your AVCHD video files. Or you can simply drag the files to import into. 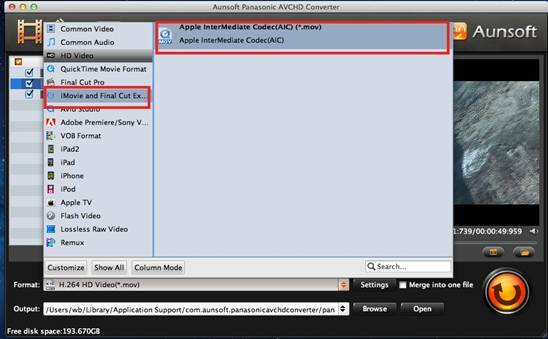 And then, in the Profile list of the program, you will find the option for AIC, Apple Intermediate Codec, output, which will be 100% compatible with iMovie 11. You must be sure that it is set as 1920x1080 for video size. It can be checked in the “Settings” window. Generally, it will be the default settings. By this way, even if your footages are shot in AVCHD Lite file, 1280x720, it will also be encoded into 1920x1080, as same as AVCHD video files. Click “Convert” to start converting AVCHD files. 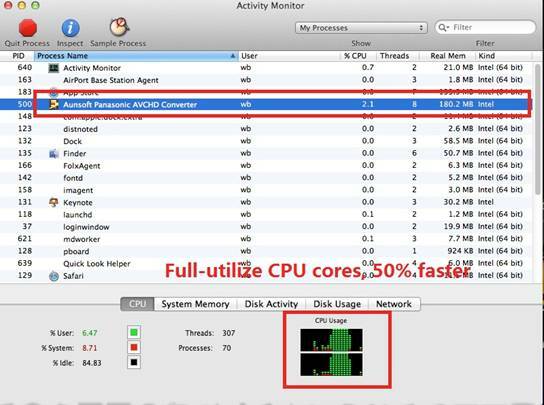 It will be done in a quite fast speed since all of your CPU cores will be full-utilized. In this way, you will be able to import AVCHD to iMovie 11 and edit AVCHD video in iMovie.